Millie continues to recover nicely. She is eating a little more, drinking water, swatting and Harley on a regular basis, and I haven't seen or heard any vomiting. She's also bathing herself very well, which is a sign that her tummy is not bothering her. Her eyes are brighter and she doesn't seem as worn out as she did last week. We still have some meds left, and I'll make sure she finishes those off. She hates it, of course, but I'm not in a position to let her stop now. And let me just say that her vetrinarian through this ordeal has been WONDERFUL. American Vetrinary Hospital in Stockton is great. They didn't mind me bawling all over the place when I left her, and they let me visit her to see her for myself and comfort her. They understand that the bond between a cat and its human is special, and were honestly delighted at her reaction to seeing me that Monday afternoon. Her vet, Dr. Singh, took time to answer all of my questions whenever I called. The ONE time he wasn't able to talk, it was because he was in surgery on another animal. He was kind, reassuring, and honest about his concerns. He treated Millie with utmost care and concern. Since she came home last Monday, he has called every couple of days to ask how she is doing, and has sounded genuinely happy when I report that she's eating a little, not vomiting, and cleaning herself. I will recommend these people to anyone in Stockton looking for a good vetrinarian, and I will always be grateful for their help with my girl. Harley, meanwhile, has won over his grandparents with both paws tied behind his back. He made himself right at home. Needless to say, this pissed Bella and Duchess off to no end, but they're getting used to him. He has shown that he is an equal-opportunity cuddler, and he is proving the superstition that orange male cats are the friendliest right. He spent an entire day being cuddled and played with by three kids, and he loved every minute of it, never once leaving the room to hide. Harley is still wearing the purple collar he came with from the shelter. His grandma does not approve. Purple is too girly for her grandkitty, and tomorrow, we will brave the pet store so I can get a more appropriate color for him. "He needs blue or green," Mom insisted earlier. 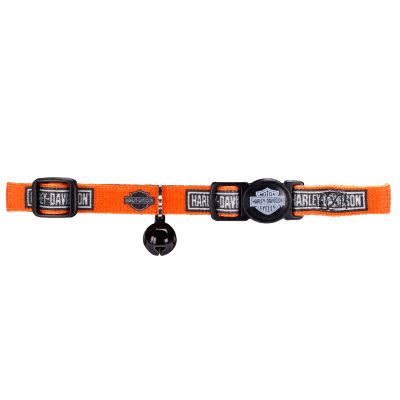 I joked that I should look for a Harley-Davidson cat collar. Guess what? Turns out such a thing exists. Meanwhile, Mom and I went to see Twilight today, and do a bit of last-minute shopping (it's a madhouse out there!). When we got home, Dad was in his recliner, bundled up in a fleece blanket, with Harley cuddling him. Harley wouldn't let Dad read his magazine, insisting instead that he be cuddled and petted. So, both of my babies seem to be doing very well. Harley spends his nights in the bathroom, and Millie curls up with me. I'm a happy mom. Awww... Seeing that picture of your dad and Harley made me think that a kitty's love and affection are such good medicine. :) That right there will have given your dad's body and soul a boost to speed his recovery!